Spain have made a habit of conceding goals from counter-attacks and the opposing teams have exploited that weakness. They typically play a lot of short passes in the middle and final third and therefore, have to employ a lot of players in those areas. As a result, whenever they lose possession, their players do not have the time to fall back and intercept the counter-attacks. Croatia had almost scored twice against them from such counter-attacks and England had punished them in a similar way in the previous match. Sergio Busquets, Spain’s defensive midfielder, is not a hard tackler and therefore, cannot be trusted to stop fast counter-attacks on his own. Therefore, the onus is always on the centre-backs to stop those attacks. Players like Ceballos and Saul need to be more alert and curb their attacking instincts to some extent in order to prevent these counter-attacks. Ceballos actually scored his 1st international goal in his 4th match yesterday but could have put up a better defensive show as well. Spain’s wingers also need to develop the habit of high pressing as soon as they lose possession of the ball. 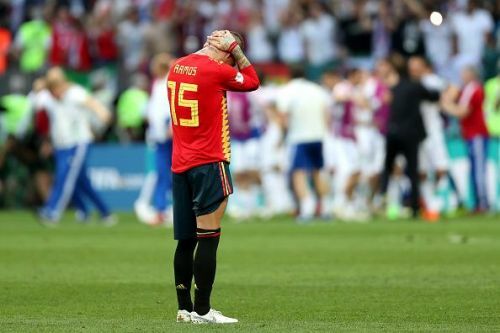 When Spain dominated world football from 2008 to 2012, their midfielders and forwards hardly lost possession and whenever they did, they hunted in packs to make sure that the opposition does not get enough time to originate moves.